In just one second, the Sun gives off 13 million times the energy that is generated by all the electricity consumed in one year in the United States. Only one millionth of the Sun's energy reaches Earth, but this scant amount would be more than sufficient to meet the energy requirements of our entire planet. The relative difficulty in extracting energy from the Sun, when compared to systems that derive energy from fossil fuels or nuclear power, has hindered its development as a widespread source of energy. On a smaller scale and in many experimental projects, however, solar energy has proven highly effective in producing both electricity and heat. Solar energy was first explored for electrical purposes in the 1950s, when the need for continuous electric power generation on space satellites spawned the development of a solar cell in the Bell Telephone Laboratories of the United States. Even today, though, the best silicon solar cell converts sunlight to electric power with only 18% efficiency. Still, experiments have utilized sun-generated electricity with great success. One highly visible project focusing on solar power is the annual international solar-powered automobile race. Solar energy has proven more effective and has been more widely utilized for both water and space heating and cooling systems. As a water heater, solar energy is most commonly used to heat swimming pools. For space heating, two main types of systems are used. 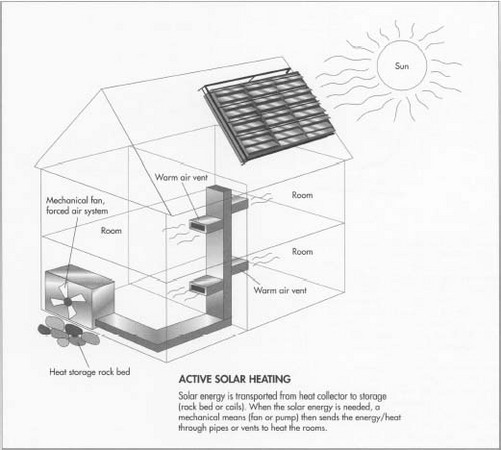 A passive solar heating system admits solar energy directly into a building through large windows facing south (in the northern hemisphere) and directly heats the space within (this is known as direct gain and is also referred to as the greenhouse effect) or through a wall or roof that absorbs the solar radiation, stores the resulting heat, and transfers the heat into the building (this is known as indirect gain). A passive system may also utilize an absorber and storage components (such as a rock bed) that are not a part of the building, but are contained in their own separate chamber. This is known as an isolated-gain system. Active solar heating systems use water or air to transport heat from collectors mounted on the south-facing side (again, in the northern hemisphere) of a building's roof to rock beds or water tanks. The stored heat may either be allowed into a room directly when utilizing rock beds and air as the transfer fluid, or through fan-coil units when the solar energy first heats water. The heat is then transferred through the coils to heat the air. Cooling systems are also divided into passive and active systems which utilize night air and condensation to cool the air in a building. Different types of solar collector panels may be used and suited to the type of facility being heated or cooled. A flat-plate collector, a large, flat box with a glass top and a heat-absorbent black bottom containing pipes that run parallel to the top and bottom, is best suited to domestic use. A concentrating collector, made of reflecting materials and shaped like a trough or bowl, is best suited to industrial use. use of a human-constructed solar collection system dates back to 1776 when Swiss scientist Horace de Saussure developed a rudimentary collector commonly referred to as a "hot box." Astronomer Sir John Herschel used hot boxes to cook food during an expedition to Africa in the 1830s, and the use of solar thermal energy for cooking and water distillation purposes subsequently became common in certain parts of Africa. Early American pioneers of the late 1800s used black pots and pans to heat up water as they traveled during the day, thus popularizing the use of solar energy to heat water. The idea was put into widespread use in areas of the country which otherwise had to import fuel for water heating. For example, in 1897 nearly 30% of the houses in Pasadena, Califomia, utilized solar water heaters. Solar energy continued to be used moderately throughout the next century, but leapt in popularity during the energy and oil crisis of the 1970s. Use of solar energy tapered off as the energy crisis waned, but has risen again in popularity in the 1990s as populations become increasingly aware of the environmental and public health hazards caused by the burning of fossil fuels and the use of nuclear power. Because there are many types of solar heating systems, there is a wide variety of raw materials that may be used in their manufacture. This entry will focus on a basic residential passive system and a basic residential active system. A passive solar heating system requires a black flat-plate collector panel made of a steel absorber plate covered with two sheets of glass and an insulating pad made of fiber-glass insulation or polyurethane foam with an aluminum foil facing, which acts as a moisture barrier. The system is contained in a shallow box made of wood, galvanized steel, or aluminum. The system also typically requires a heat storage bin, containing dry pebbles or rocks. This unit stores heat when a building is sufficiently heated. In addition, the system requires a differential thermostat, an electronic system which allows manual control of the heat levels and, thus, room temperatures, and an air-handling module consisting of connecting ducts, air filters, a blower, and automatic dampers. must be used to contain them and, obviously, water pumps and coils are not necessary. All solar heating systems utilize caulking, aluminum siding, and closure strips, most likely made of rubber, paint, and wood. 1 Flat plate collectors are installed on either a pitched roof or vertical walls by installing shallow, sheet metal manifold pans, which resemble large baking pans, at each end of the collectors and fastening the pans to the rafters of the roof or wall. Caulking is then applied liberally around the upper edge of the manifold pans. Sheathing is next attached to the roof or wall, and all seams are caulked. Manifold slots are cut in the sheathing, and blocking is fastened around the perimeter of the sheathing. 2 The absorber plate is installed over the sheathing, extending to the outer manifold blocking. The ends are sealed with end closure strips, typically made of rubber and caulking. The top and bottom edges are also caulked. 3 Battens are fastened to the absorber O plate, and a glazing system consisting of a single layer of glass on a roof or a double layer of glass on a wall is attached. 4 Aluminum glazing bars are installed around the perimeter of the collector. 5 In a passive system, the air handling system consists solely of ductwork installed between the collector and the living space, as well as a fan and a manual control to activate the fan. An isolated gain system would also include a separate storage chamber and ductwork leading to and from the chamber. 6 In an active system, a storage bin holding rocks or water is required to store excess heat. Ductwork with on-off dampers are installed running from the collector to the house, the collector to the storage bin, and the storage bin to the house. Two fans are installed. 7 A rock storage system is constructed of an insulated bin filled with small rocks 1-5 in (2.5-12.7 cm) in width. Sufficient space is allowed between the rocks to facilitate the blowing of air through the duct connections at either end of the bin. 8 A water storage system is similar to the rock storage system, using water rather than rocks. For a residential solar heating system, the fit of the end closures and adequacy of the caulking on the collectors may be tested using a smoke bomb to detect any leaks. The smoke test is conducted prior to glazing. As more prototypes of solar-heated and solar-powered living and commercial units are developed, this source of energy shows serious signs of growing into a source of heat and electricity that is more than experimental. Environmental and natural resource groups, as well as and often in cooperation with the United States Department of Energy and several international organizations, continue to push for a more widespread reliance on solar heat and power as well as continually develop new and innovative uses for this source of energy. While the work inside the Department of Energy's Solar Energy Research Facility focuses on photovoltaic power, the building itself stands as a testament to the success of solar energy. The building's innovative, window-laden, stairstep-like design allows for direct sun lighting and heating and stands as an example of how successful the reliance on solar energy can be—and how prevalent such reliance could become in the future. The American Solar Energy Society demonstrates the practicality of solar energy in its annual solar home tours. The organization also keeps its members posted on legislative developments regarding solar energy matters. In July 1996, for instance, the organization was active in lobbying for the passage of renewable energy funding legislation. While no such legislation has been enacted to date, introduction of such bills indicates an interest in solar energy issues among at least some members of Congress. The International Solar Energy Society is concerned with similar issues on a global level, and works for a greater reliance on solar energy worldwide. American Solar Energy Society. June 3, 1997. http://www.csn.net/solar/ (July 14, 1997). Center for Renewable Energy and Sustainable Technology. http://solstice.crest.org (July 14, 1997). International Solar Energy Society. http://www.ises.org (July 14, 1997). Passive Solar Industries Council. http://www.psic.org (July 14, 1997). to learn and imlements new innovation for non renewvable energy resources.